Guaranteed to attract attention and make a man stand out from the crowd is an enviable V-shaped taper. Starting from wide “boulder” shoulders extending down into “cobra” popping lats and tapering down to a sculpted mid-section and V-cut obliques! This perception of the perfect physique is not just attractive to others but is also the criteria in which most physique and bodybuilding competitions are judged upon, the shoulder to hip ratio. So how do you acquire this physique? 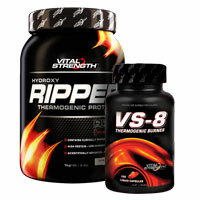 And is it just for bodybuilders or guys with perfect genetics that can achieve it? The simple answer is ‘no’. Here we show you how you too can sculpt your body into the Ultimate V-Taper, beginning with the all-essential “Wings” aka latissimus dorsi muscles. It’s all about building a back so big it needs its own postcode; bigger, wider lats built by pulling longer, stronger and harder. Building the lats is not easy but below is a workout guaranteed to assist you in achieving the best results, focusing on both pull-down movements (to build width) and rowing movements (to build thickness). 1. Grab the bar with a wide overhand grip. 2. Keeping your arms completely straight and crossing your ankles behind you, hang at arm’s length. 3. Slowly pull yourself up until your chin is over the bar. Slowly lower your body back down to hanging position. 1. 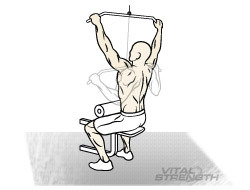 Position yourself on a low pulley row machine. 2. 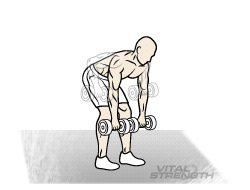 Leaning forward, grab hold of the wide bar and then lean back until your torso is completely upright. 3. Leading with your elbows, slowly pull the bar back towards the bottom of your chest. Slowly move arms back to the starting position and repeat. 1. With dumbbells in each head, bend at your hips with straight back and lower your torso until it’s nearly parallel to the floor. Let the dumbbells hang at arm’s length. 2. Row the weights upward by raising your upper arms, bending your elbows and squeezing your shoulder blades together. 3. Pause at the top, lower the dumbbells and repeat. 1. 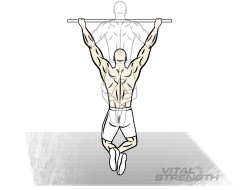 Stand about 1m back from high pulley (to target delts) and grasp rope attachment with both hands. 2. Extend arms down. Turn palms down at bottom. 3. Return until forearm is close to upper arm and hands are in original position. Repeat.